2 I play in the phone app, but I never made any account. How do I play on other versions? 3 Something's wrong with my account/my purchase didn't go through. Where do I send a support ticket? 4 Which element should I play? 5 Is X character good? 6 How should I prioritize spending my AP/EP? 7 Help, I’m too weak to do things and these events are too hard for me! 8 What support/main summon should I use? 9 Can I reset my support summon list if there are no good ones to pick? 10 What class/job should I level first? 11 How do I restore AP/EP? 12 How do I get more Rupies? 13 What should I do with all these R/SR weapons/summons? 14 Is the Rupie Draw worth it? 15 What do I spend Moons on? 16 What does "Rainbow Meta" mean? 17 Should I uncap my weapons with Damascus Ingots/Gold Bricks? 18 How do I get more party slots? 19 How do I remove skills from the skill queue? 20 How do I search for a friend by ID? 21 How do I favorite a quest? 22 How do I switch between the Male/Female MC? 23 How do I stop people from sending backup requests in my raids / speed up the game / disable Vyrn popups? 24 Why do some people call Omegas "Magnas", or charge attacks "ougis"? What does [this word/term] mean? 25 My question isn't here! As wikis are not designed for individualized technical support, it is better to ask a community such as our Discord or the Granblue EN subreddit about specific technical issues. You can also contact Cygames directly, but note that they only communicate in Japanese. As a best practice, ensuring your application/browser/system is up-to-date and clearing your cache/cookies is usually a good first step for solving issues with Granblue. I play in the phone app, but I never made any account. How do I play on other versions? You currently have a guest account, and you need to register it to use it anywhere else. Go to the Mailbox on the homepage and choose the "Register with Mobage to change your nickname" option. Follow these steps, and in the last step enter your Email address. The email you get must be opened in a mobile browser. Enter the information it asks for to finish registering your account. Use this login on any version of the game listed above. Something's wrong with my account/my purchase didn't go through. Where do I send a support ticket? Here for Mobage account users. 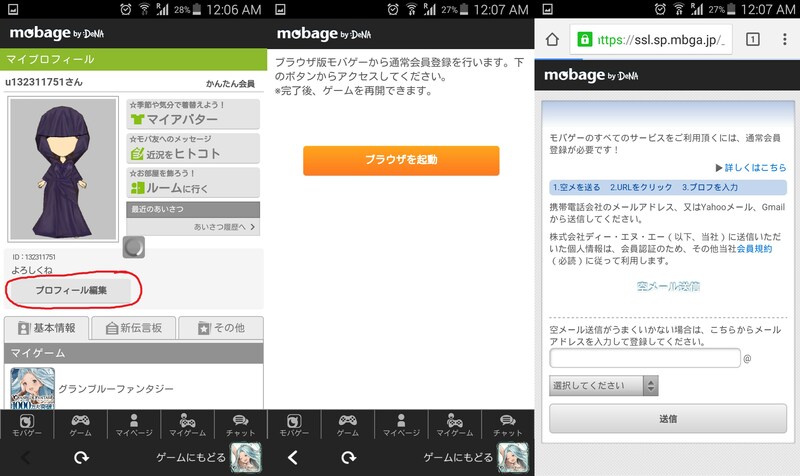 You need to be signed into the Mobage account tied to your GBF account. However, the interface and the support team only communicate in Japanese, so you need to send them a message in Japanese, or ask a translator for help. Which element should I play? Wind is the most newbie-friendly element by a considerable margin, but you can start with any element for which you have multiple powerful characters. Light and Dark are not recommended, however, as their Basic Grids are very difficult to farm relative to Wind, Earth, Fire, and Water. See the Character Tier List and its sources for detailed evaluations of various characters. Generally, anyone rated at least 9.0 is excellent and you'll find yourself very happy to have them throughout the game. If you want to keep creating new accounts until you acquire a particular character, see the Rerolling guide. How should I prioritize spending my AP/EP? Help, I’m too weak to do things and these events are too hard for me! effect. Elemental teams are better later on and you should work on making a strong elemental team eventually, but using Grand Order early works nicely when you’re still new and your character elements are varied. What support/main summon should I use? For your main summon, you will usually want to use the highest "X% boost to Y Elemental ATK" for the relevant element. As your weapon grid improves, you will eventually transition to Primal or Omega summons. See the Damage Formula for details on the calculations. Can I reset my support summon list if there are no good ones to pick? Yes: starting any quest will refresh the list, the easiest of which are any of the Trial Battles under Home > Gameplay Extras. Simply start the battle and retreat. What class/job should I level first? Most new players should rush Dark Fencer first, so master its prerequisites as quickly as possible. How do I restore AP/EP? How do I get more Rupies? Farm Co-op quests and sell the Disks that drop. If someone else hosts the quest, it doesn't even cost AP. What should I do with all these R/SR weapons/summons? Is the Rupie Draw worth it? Yes: it provides +1 weapons/summons, rare weapons with skills for use as fodder, and occasionally even new characters / moons. What do I spend Moons on? For the most part, you'll want to spend bronze and silver moons on Half-Elixirs, and gold moons on CP. A free player won't get enough of these to purchase anything bigger in a reasonable amount of time. What does "Rainbow Meta" mean? Rainbow Meta colloquially refers to the developers' recent tendency to create content requiring a certain element (eg. Xeno Ifrit heavily penalized players not using a Water team), meaning it is no longer possible to efficiently complete all content by developing only one element/team/weapon-grid. That said, all basic content is still doable with one element and focusing on one element and then using that element to farm the others is still the most efficient method of early progression. Should I uncap my weapons with Damascus Ingots/Gold Bricks? No: Damascus Ingots and Gold Bricks are some of rarest items in the game, and should only be used for very specific purposes (see their pages or ask the community). How do I get more party slots? All party slots are now available from the start, and no more can currently be purchased. How do I remove skills from the skill queue? Click the skill icon in the queue. How do I search for a friend by ID? Open the Menu in the top right and choose the Friends. Select the Search button, then the ID tab. How do I favorite a quest? A quest can be favorited in the Quest Result screen after completing it. Quests can also be favorited by tapping on the small exclamation mark next to the picture of a quest. To favorite a special quest click select and then click the picture of the quest you want to favorite. How do I switch between the Male/Female MC? Menu > Profile > Male/Female button in the top left toggles between them. How do I stop people from sending backup requests in my raids / speed up the game / disable Vyrn popups? Menu > Settings > Battle contains most options related to actual battles. Why do some people call Omegas "Magnas", or charge attacks "ougis"? What does [this word/term] mean? Many players started before the official English translation, so sometimes unofficial translations or Japanese words became the accepted English community standard. Check the term in the Glossary to see what any unfamiliar term means. If you're wondering about a character/item/summon/concept, try searching its name. If that doesn't work, feel free to ask for help in our Discord. This page was last modified on 26 March 2019, at 07:54.